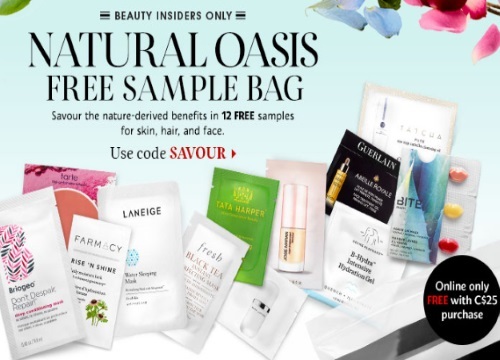 Sephora is offering a new Free Natural Oasis Sampler Bag with 12 Free Samples with any online order of $25 or more for Beauty Insiders! This includes nature-derived benefits for your skin, hair, and face that rescue, protect and nourish. Products include: Drunk Elephant B-Hydra Intensive Hydration Gel, Marc Jacobs Coconut Primer, Laneige Water Sleeping Mask, Josie Maran Argan Illuminatior, Tarte Amazonian 12-hour blush, Tata Harper Resurfing Mask, Farmacy Daily Moisture Lock, Fresh Black Tea Instant Perfecting Mask, Guerlain Abeille Royale, Briogeo Deep Conditioning Mask, Bite Agave Lip Mask, Tatcha Cleansing Oil. Enter the promo code SAVOUR at checkout. Offer available while quantities last.